The U.S. Army Corps of Engineers seeks comment on dredge spoil placement on islands along the Lower Columbia River. The request concerns a draft environmental assessment of continued maintenance of the Columbia River federal navigation channel. The proposed maintenance includes putting dredge spoils on the eastern shoreline of Rice Island and rehandling material at an in-water site near Howard Island. The public comment period ends Sept. 7. Shoreline placement at Rice Island, located near river mile 22 next to the Lewis and Clark National Wildlife Refuge, would rebuild and protect the existing upland placement site. It would also allow development of a forage area for streaked horned larks, which were listed as threatened under the Endangered Species Act in 2013. 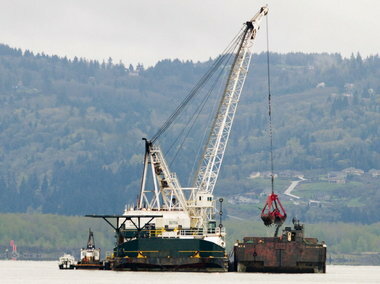 In-water re-handling of dredged material is required near Howard Island, near where the Cowlitz and Columbia rivers meet, because shoaling is consistently forming too far away from the island for a dredge to directly pump that material to the existing upland placement site. Find the Corps' draft environmental assessment here. Comments and questions regarding the draft document should be directed to Kate Michie at 503-808-4664 or email. Mailed comments to Michie must be postmarked by Sept. 7 and sent to: District Engineer, U.S. Army Corps of Engineer District, Portland, Attn: CENWP-PM-E/ Kate Michie, P.O. Box 2946, Portland, Oregon 97208-2946. In responses, refer to the public notice number (CENWP-PM-E-15-05), title and date. If no response is received and postmarked by the closing date, a "no comment" response will be assumed.